Tesla Can’t Get You There … and Jaguar? 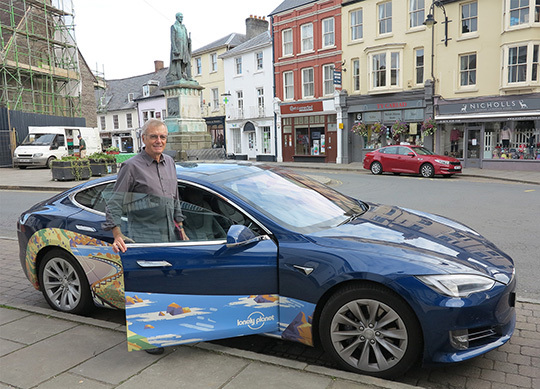 ▲ Me and a Tesla Model S – promoting Lonely Planet’s Epic Drives – in Wales. I don’t have a Tesla in my garage in Australia – if the Tesla Model S was just a little bit smaller I probably would have one, but it was a real squeeze fitting one in and I could see I’d have to move it out of the garage every time I wanted to extract one of my bicycles. Perhaps a Tesla Model 3 will take up residence, if it ever goes into real production, or perhaps some other electric car will have won me over before then? Meanwhile Tesla emailed me to say ‘We recently launched Go Anywhere — a trip planning tool that allows you to map any route in Model S or Model X.’ Just click on ‘Explore a Route’ and Tesla will tell you how to get there. So I did, take me from Melbourne to Alice Springs, Alice Springs to Darwin, Darwin to Broome, Perth to Adelaide, I clicked. They’re all Australian trips I’ve done over the years, some of them multiple times. Or a little Western Australia trip I hope to do later this year, Perth via Geraldton (to visit the Houtman Abrolhos Islands) and on up to Dirk Hartog Island (now that’s going to require 4WD). Sadly in every case the Tesla message was ‘We’re working on getting you there. View supercharger locations coming soon.’ In other words you can’t drive there at the moment. Although presumably you could, there are lot of places along the way and if you had the time I guess you could plug in to 240 volts and wait for the batteries to charge? In fact there isn’t a Tesla dealer in Western Australia yet, perhaps that’s why Perth is effectively isolated from the rest of Australia. 1 May 2018 update – go to the Tesla Owners Club Western Australia website and you’ll find a link to news on charging stations being established across the Kimberley – you can now charge your Tesla in Kununurra, after you cross the border into WA from the Northern Territory, and then Warmun, Halls Creek and Fitzroy Crossing before you reach the coast at Derby. So a correction to the para above, WA is no longer so electrically isolated. I played with the Tesla trip planner outside Australia as well, how would it have done on my drive last year from Bangkok to London? Well no luck from Bangkok until you get well into China, then surprisingly well in in the eastern half of China after which you’d need a long extension cord until you got to Budapest in Hungary. So in Europe Tesla is in the western half, forget about it when you cross what used to be the old Iron Curtain. 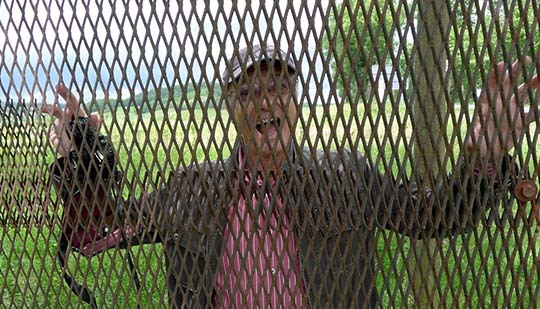 ▲ Me at the old Iron Curtain in Germany. In 2017 my Australian garage featured four cars, none of them electric. So which was most reliable? We’ll discount my Silk Road MGB, I sold it at the end of the year in any case. We can hardly expect a 45-year-old car to be super reliable, but Burgundy did get me all the way from Bangkok to London along the Silk Road without any great problems. That has to count as some sort of reliability doesn’t it? I have owned Australian, German, Japanese, Italian, American cars over the years, but weirdly enough, all my 2017 cars were English. Even more weirdly the most reliable would have to be my Lotus Europa. It’s now 10 years old, I didn’t use it much in 2017 (busy driving the MGB to London), but it’s never caused me any problem at all and we all know what LOTUS stands for: Lots of Trouble Usually Serious. Next up would be Maureen’s Mini Cooper S, now four years old. The only real problem with that was fairly early on when it started jumping out of gear and there was a long wait for BMW (who make the Mini) to import the shift-linkage parts needed to fix it. Later on it went in for a service and after it got there BMW announced there was also a service recall (main bearings! wow!) and again that took them a while to find the parts so the car was with them for a week. Bottom of the heap, however, and by a long way, is my Jaguar XE. Now why did I buy a Jaguar? Because the Tesla didn’t fit my garage for starters, because I always think of African dictators when I look at Mercedes, because I’ve already owned an Audi, because Honda didn’t have stop-start technology (Eco-Start Jaguar call it), because I wanted something different. Something somewhat less than reliable it’s also turned out. All the problems have been electrical, most often it’s been the Eco-Start deciding not to Stop, but it’s also been the regular starting deciding not to Start, not to even think about starting, you press the start button and nothing happens, total inactivity. Plus I’ve had the touch screen stop functioning, which took air-con, heating, radio, satnav, rear view camera and lots of other useful features with it. Apart from those repeated electrical problems it also takes my local Jaguar Land Rover dealer (ULR, Malvern, Australia) a long time to fix anything. They couldn’t even look at the faulty touch screen for weeks and then took a solid week to fix it. Recently, after nearly two weeks – while they sorted out the Eco-Start and not starting at all problem – they’d replaced ‘faulty BCM and KVM’ – see below! 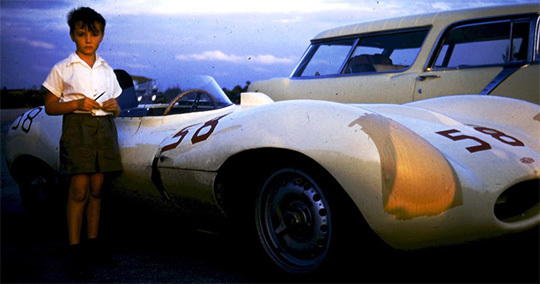 Hopefully the electrics will now become more reliable and I have done a week-long-trip with zero problem so perhaps that old line that if you want a Jaguar you better buy two – one for your place and one for the dealer to be fixing – isn’t going to be true long term?